When asked to think of sports, you’ll probably make your way through the likes of football, soccer, rugby, tennis, basketball, baseball, volleyball, and more before you make your way to table tennis. 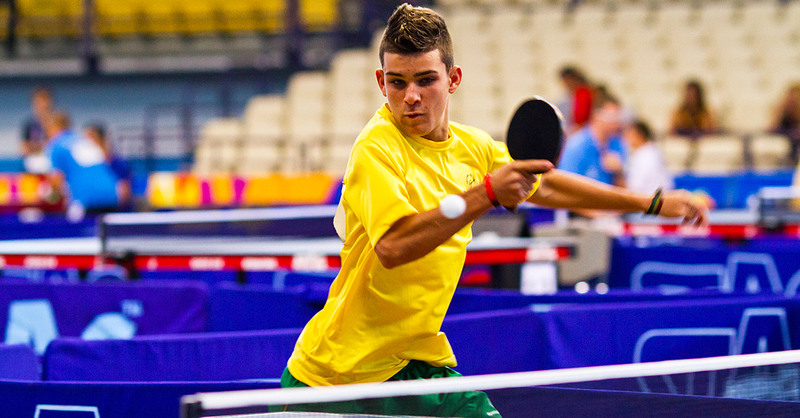 Despite the fact it’s relatively unknown as a competitive sport, table tennis is becoming increasingly popular. Not only is the game fast-paced and exciting, but there are also some pretty handy health benefits associated with it, too. If you’ve ever seen a professional table tennis match, you’ll probably agree that there isn’t much to see – mostly because the players are so good the ball is hit too fast for your eyes to keep up! The art of table tennis not only requires incredible focus, but it also requires mind-blowing hand-eye coordination. As the ball is hit across the table, you need to be quick enough to move your body and your arm in time to hit it back. As you practice the skills required for table tennis, you practice your tactical strategy, mental alertness, and your reflexes. Just like any other physical activity, table tennis allows you to burn calories while you’re playing. Many players find table tennis addictive because you are constantly having to move your whole body in anticipation of the next move. And luckily, this means they can get in a good workout at the same time. Researchers have found that a player who weighs 150-pounds will burn around 270 calories each hour. Not bad! Many people often believe table tennis to be extremely therapeutic and find that after a game they feel awake and stimulated. This is because the game of table tennis works various parts of the brain at the same time. To play a game of table tennis successfully, the player must be able to exercise their strategic planning to anticipate their opponent’s next move, as well as their own. This action requires the use of the prefrontal cortex. Alongside this, the game of table tennis also requires aerobic exercise – which can often be quite ruthless and intense depending on your opponent. The act of physical movement stimulates your hippocampus. The main role of the hippocampus is to help us create and maintain new information, so any stimulation will only be beneficial to the player. When you stimulate your brain on a regular basis – i.e., playing table tennis, you can drastically improve your long-term mental health. Many scientists have found that there is a correlation with table tennis and heightened cognitive awareness and motor skills. Alzheimer’s Weekly also found that playing table tennis increases the blood flow to the brain, and can even prevent dementia in some cases. If you’re the kind of person that doesn’t like contact sports but still want to get involved in a team mentality, table tennis could be for you. Because you have to play with others, this game places you in a social environment that allows you to interact and bond with other people from all walks of life. You can either find a social club near you and meet like minded people who also love table tennis, or you could even begin to play table tennis with your family, so you can spend even more quality time with them and become even closer. Are you looking to try a new activity? A new sport? Or just want to meet new people? Why not try out table tennis? It’s not only fun, but there are some awesome benefits that go with it, too. What have the cast of Jurassic Park been up to?